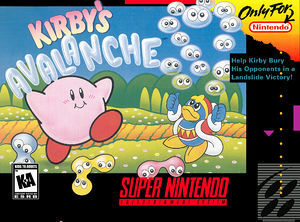 Kirby's Avalanche, known in Europe as Kirby's Ghost Trap, is a puzzle video game co-developed by HAL Laboratory, Compile and Banpresto. It is the western release of Super Puyo Puyo and the fourth Kirby game released for the SNES. Problems that may occur with any Super NES title on Dolphin are listed below. Sound is glitched in the OpenAL backend. Use XAudio2 to prevent this. Fixed in 5.0-798. The graph below charts the compatibility with Kirby's Avalanche since Dolphin's 2.0 release, listing revisions only where a compatibility change occurred. This page was last edited on 21 February 2018, at 04:50.